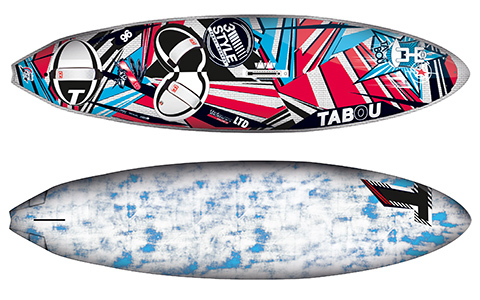 The 3S has been in the Tabou line-up for several seasons now, classed by them as the ‘Swiss Army knife’ of their range. Unchanged for 2016 save for a graphic update, the 106 is the second largest in the series and comes available in CED or LTD construction (as tested here). As one of only two single-fin boards in the test, it is supplied with a large 32cm foil and has a variety of interesting features in the tail, including a double tail cutout (said to improve acceleration and top speed), and winged swallow-tail aimed to optimize surface distribution for speed and versatility. Finished with thick, contoured dual density deckpads and Tabou’s branded Cobra straps, it is also worth mentioning the outboard footstrap plugs are more outboard than most others in the group. “The 3S is the one board that I will always take with me on the road around the UK. The conditions can be so different from day to day but I know I can still always go for a sail on a 3S and have a great sail. Whatever style of sailing I choose to do, the 3S is there to support my demands.” Ross Williams. Capable of carrying a 6.5m sail easily, the 3S is very directionally stable and releases from the water easily as power is applied. It requires little encouragement and accelerates quickly, feeling active underfoot with obvious drive from the fin to push against. Settling into the straps, the 106’s speed and acceleration let the rider adopt quite a locked in stance, the back deckpads providing a handy ridge further outboard with which to drive hard against the fin. One of the more competent boards in the group directionally, it nonetheless has smooth response to foot steering, which combined with its stable dependable nature in harsh chop, make it a comfortable board for coastal blasting in challenging conditions. 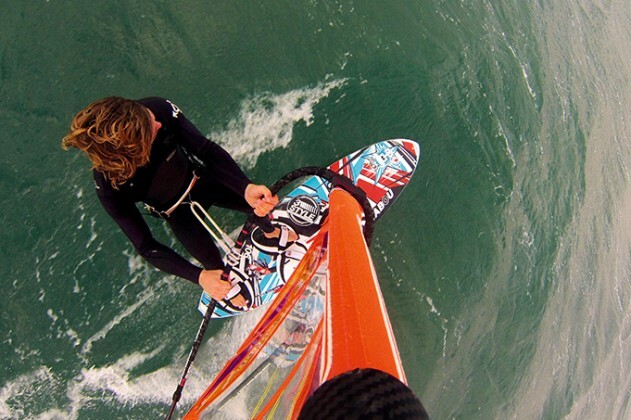 In the gybe, the 3S cuts in willingly, and whilst not as loose or reactive as some, bites with confidence and carries speed through the turn to the exit. Go in with more speed and commitment and it won’t let you down, gripping hard through a smooth even arc. In a wave break, the 3S is a master for jump and bump antics, its speed and release lending the board to being thrown into aerials. On a wave face we did find the 106 stiff, even when used with a smaller fin. It is always willing, but was found wanting when trying to push hard for tight sections, or redirect quickly on the face. As such, the 3S is a fast, lively blasting machine for covering great distances in comfort, whatever the sea state. Early to release and one of the fastest in the group, imparting confidence with its supreme controllability, the 3S can be taken into any environment and provide hours of blasting enjoyment. 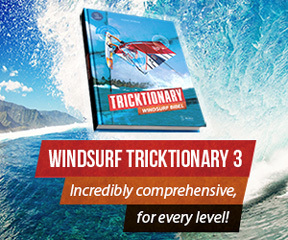 A perfect tutor for those progressing into a more challenging coastal scene.